I have decided to follow Brad's presentation of a Positive Discipline Tool Card with my articles on the same tool card. First I want to mention how it touched my heart to hear that Gibson got tears in his eyes when he heard his Dad's compliment. The picture says a thousand words about how important it is to hear heartfelt compliments. Several years ago some Adlerians recorded a bunch of family meetings in different families. For two years they looked for the perfect family meeting. Finally they gave up because they couldn't find a perfect family meeting. However, they were delighted with the positive results in families (more effective communication, focusing on solutions, having more fun together) even though their meetings were not perfect. Keeping in mind that mistakes are wonderful opportunities to learn, the biggest mistake parents made that kept the meetings for coming closer to perfection was talking too much. Children are not thrilled about family meetings that provide another platform for parents to lecture. Parents need to talk less and listen more. Yes, I know how difficult this is—I’m still working on it. Somehow we parents think we aren’t doing our jobs unless we are talking, talking, talking. Another mistake was trying to “fix feelings” (or to try to talking children out of having their feelings) instead of just listening. Sometimes it can be encouraging to validate feelings, but try validating feelings with you lips together, "Mmmmm." This allows children to discover that they can work through their feelings and learn from them. 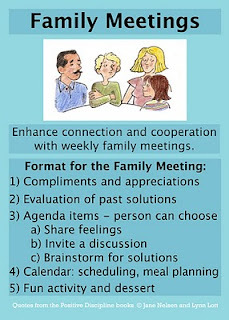 It is most effective to have family meetings once a week and to stick to the allotted time of 20 to 30 minutes—even if everything on the agenda has not been covered. This just might help your children learn "delayed gratification." Also, it gives them time to absorb what was discussed during the meeting, to try the agreed upon solution, and to practice working things out for themselves in between meetings. Where else can you get so much for such a small investment in time? Family meetings provide a wonderful family tradition that may carry on for generations. A funny story about that: my children loved family meetings when they were six to twelve or so. Then they started complaining, as typical teens do, about how stupid family meetings were. I asked them to humor me and that we could shorten the time from 30 minutes to 15. When Mary went off to college, she initiated regular “family meetings” with her roommates and said they would not have survived without them. I love that you are complimenting Brad's blog with the articles on the tool cards. I'm really enjoying following Brad's experience using the tool cards and implementing them in our home too. Your posts really add to the whole experience. It is encouraging to be reminded that family meetings don't have to be perfect to have a positive effect.